I am not a banana enthusiast. If all of the fruits were lined up on stage for me to select one-by-one for eating, the banana would definitely be among the last remaining few, looking awkward and feeling self-conscious… I tend to prefer fruits that are juicy and refreshing. The banana makes me thirsty and drowsy. But I do know what is good for me and bananas are certainly that. I periodically buy some, hoping that the guilt of watching them rot will be enough incentive to chop one up to eat with some yogurt. Alas, I have outwitted myself. Overripe bananas don’t go into our compost – noooooo. Overripe bananas go into banana bread. For the longest time, my feelings about banana bread were pretty similar to my feelings about bananas. Thirsty-drowsy. That was until my good friend, Mary, suggested the addition of some chocolate around the same time that I was experimenting with an unsatisfactory recipe for the bread. There are two key ingredients to my banana bread recipe. When I can find mini chocolate chips, I use them. They suspend nicely in the batter and for some reason, I am drawn to tiny foods. If I can’t find mini chocolate chips, I chop dark chocolate. That works too. Larger chocolate chips are fine, but I usually see a stratification as they settle to the bottom. You could try tossing them in flour first to see if it helps suspend them. Then again, my friend Sarah doesn’t care as long as there is chocolate in there. 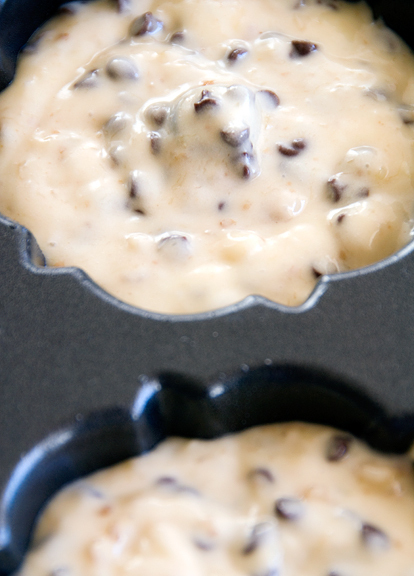 I typically bake this banana bread in loaf pans or a bundt pan, but digging through my boxes of cooking pans, I re-discovered my old mini bundtlettes. I think it frightens Jeremy that I am delighted upon finding random baking equipment that I forgot I had. My only gripe with my bundtlettes is that the chocolate chips stick to the pan and it’s quite the time-consuming ordeal to get them out without destroying the delicate shapes. Our neighbor, Tom, prefers the bundtlettes because there is more crispy surface area per bite as opposed to a loaf pan or a large bundt. Duly noted, sir! Preheat oven to 350°F. Cream together butter and sugar. Add eggs and vanilla; beat well. Mix in the bananas. 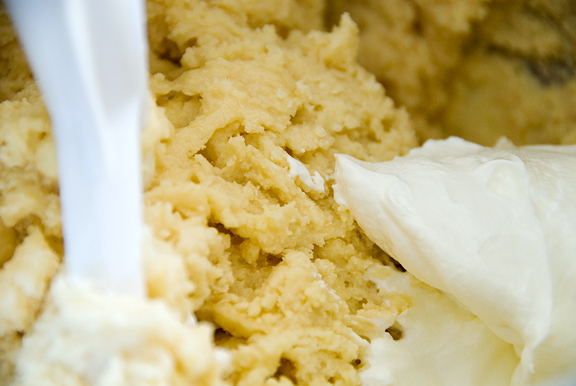 Combine dry ingredients and mix into batter alternately with the sour cream. Add nuts and chips. Mix well. Pour into two greased loaf pans (8×4-inch), or one bundt pan, or 12 bundtlettes (or anything you want, really) and bake for 45 minutes or until top is golden brown and a toothpick comes out clean from the center. (Not wet and gloppy, but moist crumbs are okay). Dusting the pan with flour may be advisable for the bundtlettes. I am not very much into banana either. But they make damn good cake. I made a lot of variations on banana bread, too. But sour cream and chocolate chips rule! I am very happy to have got this this blog last week … another wonderful and simply recipe I can try this week-end! I love re-discovering my baking equipment. I usually shout with joy and then do a cartwheel or two. Seriously though, the bundtlettes are so cool. Jen, how do you feel about banana chips? I’m also not that into eating bananas raw, although I always buy them because they’re so cheeeeeeeap. And then they go old from disuse and become banana bread! Your bundtlettes look so cute. Don’t know why I didn’t think of the chocolate chip thing earlier! Yum! These are looking good. I hate wasting bananas too. And guess what I have lying around just as we speak. A few rip, spotted bananas. Guess what I’ll be making? Your photos are gorgeous. And so are those little bites of banana-bread heaven. Do you know that if you have some speckled bananas that you’re not ready to use you can toss them into the freezer? They bake up nicely, even after months in the freezer (the skins will turn BLACK… but never fear, it works). I always made banana bread with my old bananas…sometimes I didn’t even bother to eat them fresh because I knew I’d like them better as bread! 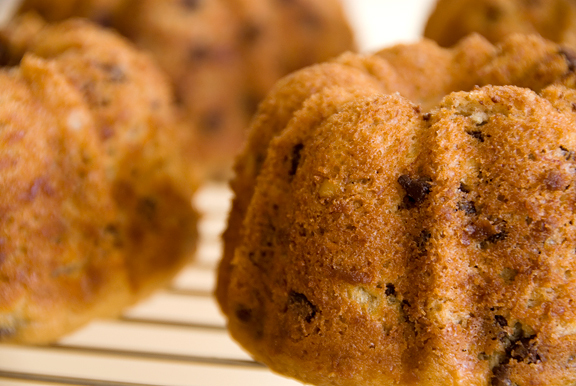 I love that you made them as little bundt-lets – so cute! how odd, i guess i’m gonna be one of the few commenters who absolutely love love bananas. perhaps you guys should try the asian variety – sweeter, smaller and less starchy. I wish my Technorati was picking up changes on this page so I could visit more often, but for some reason it is not showing updates. 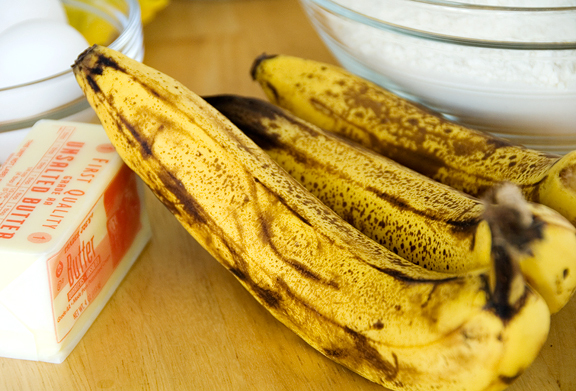 Bananas are one of the last fruits that I would grab to to eat as is as well… but they are great for baking with. They add a really nice moisture, flavour and aroma. I have bought some mini chips by Callebaut that are wonderful in baking. Your cakes look so good! Ah the dreaded left over bananas. I once made the mistake when I was on a banana kick of buying a whole bunch at Costco. We were eating banana baked goods in what seemed like forever. Your little breads look adorable. I’m a big fan of the addition of a little cinnamon and nutmeg to my banana bread, it makes worlds of difference! Along with toasting the nuts, YUM! Freeze peeled bananas in a freezer bag. We always buy more than we eat and then we freeze them for smoothies (Mark Bittman of the Times says a banana is a smoothie element). The best smoothie has peanut butter, any sort of frozen berry, honey and for some reason, cooked oatmeal. The oatmeal is to make sure you get your fiber and it’s delicious. I could smell the aroma from my monitor…brilliant combination. I loooooove looooooove banana cake/bread/muffin. Francesco – I hope it works for ya. Mandy – ha ha ha! That’s great – I hope you find them in your stocking! Meeta – awesome. I just love it when I find a recipe to use up all of the random ingredients I have lying around. Hope you like the recipe. Anita – thanks. I should just fess up to myself and accept that I buy bananas for the baking and not the eating. hee hee. tian – I say good for you! I always envy folks who enjoy bananas. I really want to love them, but my hand will automatically swerve for an apple over a banana. Wish I could be more like you. Coffee&Vanilla – Hmm, not sure why it isn’t picking up on Technorati. Is there something I should be doing to help it along? I don’t use it, so I wouldn’t know. Kevin – I’m with ya on that. Peabody – leave it to you to buy a bunch of bananas at Costco for TWO people! You crack me up. Hillary – that is a great suggestion. I’ll have to try that next time. Thanks! Christi – I like the freezing idea, especially pre-peeling. I like my smoothies sans bananas though. The flavor really overwhelms all others and I can’t take it. Just made this and put it in the oven. MMMMMmmmMMMMM. seth – great! it’s good stuff. I made this last night, with a few small changes because I didn’t want to go to the store to get the exact ingredients. It was really good – very moist and flavorful. It didn’t rise as much as I was expecting, but that might be because my baking powder is really old. This is the first time I’ve added chocolate to banana bread, and wow, it’s so good. I love it. Bridget – I think chocolate added to anything makes it extra delicious :) I have rising issues too, but it’s my elevation. I’m glad it was good, though!! 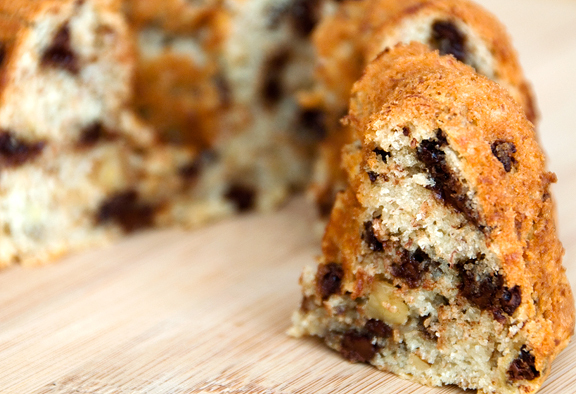 You should check out this contest for the best banana bread recipes. You could win a $50 gift card!! Shauna – that’s nice of you to suggest :) Thanks for the link. As a child we had a stand of lady finger banana plants in our backyard. However you never have just one stand of bananas and they kept popping up every where. When they fruited, Dad would hack off the purple leafy thing, from which hung nearly hundreds of small delicate bananas, and hefted it up to the veranda to ripen away from the possums (although the veranda, and the house, were invaded regularly, it was better than outside). Despite the overflow of bananas, Queenslanders all wailed when cyclone Larry devastated northern banana farms driving the price up to a record $15 a kilo. Banana prices were reported on the radio in the morning with the all-ordinaries. I confess. This banana bender is a not so closet banana lover. This is a FANTASTIC recipe! However, and this is just a couple minor adjustments to the recipe for my taste…….I found that when creaming the butter and sugar together, they didn’t cream. I read the recipe twice and realized it was just a 1/4 cup of butter. So, I added a little bit of vegetable oil, probably quite less than a 1/4 cup. Another change I made after making the first one ( I had enough bananas to make two ) is the sweetness. I am not one who likes sickeningly sweet baked goods, but after reading a lot of other recipes that called for 2 cups of sugar, I thought it probably wasn’t to much of a problem to add just a little more. My sugars were 1 cup plus 3 tablespoons of granulated sugar, and 1/3 cup of brown sugar. I also felt there could be more vanilla, so I poured a touch more than a teaspoon in my next batch. Oh, and I also toasted the walnut pieces before I chopped them. No offense to the baker, just another take on this recipe. I thank you for posting it! The sour cream makes it VERY moist. Rita – great, glad you found something you like. Sadly, I’m the only one in the house who’ll eat bananas so they always go off if we get a bunch. It seems they’ll all eat it if I make this bread out of them though! I don’t have any sour cream so I plan to substitute french vanilla yogurt. Though I have banilla (banana-vanilla) yogurt which might boost the banana flavor, yet I think I will save my banilla for my work day breakfasts of yogurt, grapenuts and fresh or frozen fruit. A good size bowl of this keeps me full until lunch time and some if I work through lunch. Thanks so much for this recipe! Personally I love bananas, they are one of my favorite fruits, but I don’t like over ripe bananas-too sweet, now I can do something with them besides eating them against my will :) I do have a question though, by Vanilla do you mean vanilla extract or actually vanilla bean? Thanks again. Regina – oh, in this recipe I mean extract. I am always gushing about your blog! This recipe is one of the reasons why! I keep meaning to write this one down but instead I get bits or flour and baking soda dusting my laptop while I whip this together! Thank you Jen! I am willing to ruin my computer if you are willing to keep your blog going! This is the first Banana Bread I have ever made. I bake cupcakes all the time, and sell them as a small business and I am ALWAYS worried they will come out dry. Sour cream definitely works in keeping things moist. This is one of, if not THE best banana bread I have ever had, and I made it! I immediately cut this cake up in several pieces and distributed it amongst family members to “show it off”. Keep the great ideas and recipes coming!!!! I just tried this recipe and am so happy with it! I had to make a few changes because of lack of ingredients and the bread turned out great. The loaf of bread was so amazingly moist and flavorful and I used the remaining batter to make mini cupcakes. I love this recipe and am so happy you shared! Here are my changes: Instead of 1c sour cream, I used a mix of 1/3c each of sour cream, condensed milk and evaporated milk. Also, Instead of 1 1/3c sugar, I used 1/2c white and 1/2c brown sugar (I used less sugar since the condensed milk is pretty sweet). This is the best banana bread I’ve ever made!! 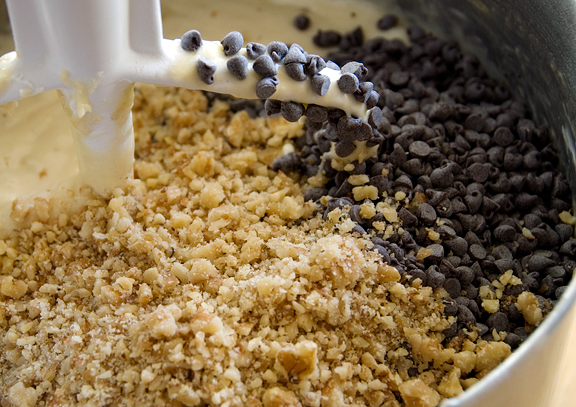 I love the addition of chocolate chips. The sour cream works perfectly to keep it moist. This is definitely a keeper. Thank you!